Find The Embassy Row Hotel deals, discounts and special offers. 1/2 block from the Dupont Circle Metro station, the Hilton Embassy Row caters to weddings, and has wifi in the rooms. Boutique hotel celebrating midcentury Hollywood luxury and style, ultra-mod Helix is near Logan Circle. A contemporary boutique hotel in an 1880 historic building by the White House, Sofitel has a bistro & art deco rooms. This landmark "Grand Dame of American Hotels" with 332 rooms and fine dining, is 2 blocks from the White House. This fully renovated landmark in Lafayette Square across from the White House, the 145 room Hay-Adams has wifi & dining. At the K street Business District, the Hamilton business hotel features restored 1920s architecture, 301 rooms & club. The famed Spa distinguishes this Asian-inspired Mandarin, in SW near the Tidal Basin; restaurants & ballroom. In Penn Quarter near to the convention centers, the boutique Monaco has free Internet and 183 vaulted ceiling rooms. A high-end Georgetown hotel with a spa and fitness center, the Four Seasons has complimentary sedan service. 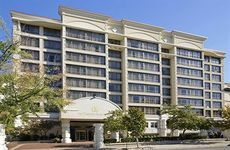 Full-service luxury hotel located 3 blocks from Capitol Building, Washington Court has 365 rooms w internet. The ultra-modern, 100% non-smoking boutique hotel is located on Capitol Hill. This facility is pet friendly. This boutique hotel in Dupont Circle has free wine receptions and WiFi in 335 French Moderne rooms. At Dupont Circle, each of the 82 guest rooms in this eco-conscious pied-a-terre boutique Madera has a sitting area. A high-end, pet-friendly hotel in Foggy Bottom, the Melrose has 240 guest rooms with wireless internet. Just three blocks from Foggy Bottom, the St. Gregory has ballrooms, meeting spaces & 154 chic rooms.